ISRAEL SUMMONED A top Polish diplomat to express concerns over legislation Warsaw was advancing regarding the Holocaust and the definition of Nazi death camps. Poland’s right wing-dominated parliament adopted legislation on Friday setting a maximum three-year jail term for anyone who accuses the Polish nation or state of complicity with Nazi crimes, or who refers to Nazi German death camps as being Polish. The measure, intended to apply to both Poles and foreigners, must still pass the Senate before being signed by the president. The charge d’affaires for Poland’s embassy in Israel, Piotr Kozlowski, was summoned to the foreign ministry for a “clarification” with senior officials, a statement read. “Israel’s opposition to the wording of the bill was expressed to him,” the ministry said. It added that “the legislation will not help further the exposure of historical truth and may harm freedom of research, as well as prevent discussion of the historical message and legacy of World War II”. Late last night, Prime Minister Benjamin Netanyahu accused Poland of seeking to deny history with the bill, sentiments he repeated at the start of the weekly cabinet meeting. “We have no tolerance for the distortion of the truth and rewriting history or denying the Holocaust,” Netanyahu said today. Noting that the bill must go through two more stages before being finalised, Netanyahu said he had expressed “our position that it must be changed”. “Over the week our ambassador (to Poland) and her team will have talks about this with the Polish leadership, including the prime minister, president and Polish senate,” Netanyahu said. Poland was attacked and occupied by Nazi Germany in World War II, losing six million of its citizens – including three million Jews – in the Holocaust. Polish officials routinely request corrections when global media or politicians describe as “Polish” former death camps such as Auschwitz set up by Nazi Germany in occupied Poland. Last night, Poland’s Prime Minister Mateusz Morawiecki wrote on Twitter that “Auschwitz-Birkenau is not a Polish name, and Arbeit Macht Frei is not a Polish phrase”. 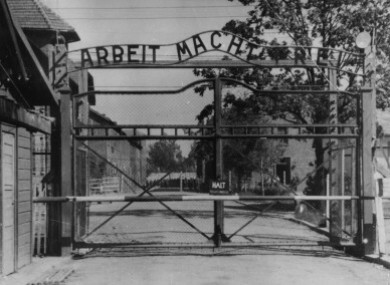 He was referring to the words on the Nazi camp’s infamous wrought-iron gate that mean “Work makes you free” in German. Yad Vashem, the Holocaust memorial in Jerusalem, said it opposed the new legislation, but also noted there was “no doubt that the term ‘Polish death camps’ is a historical misrepresentation”. “However, restrictions on statements by scholars and others regarding the Polish people’s direct or indirect complicity with the crimes committed on their land during the Holocaust are a serious distortion,” it said. Email “Poland seeking to pass laws making it illegal say it was complicit in Holocaust ”. Feedback on “Poland seeking to pass laws making it illegal say it was complicit in Holocaust ”.